The electronics component business can be cruel. The company had invested many engineers and a significant amount of capital to develop cutting-edge technology. This had led them to successfully halve the external dimensions of crystal units whilst simultaneously improving their performance. And yet, despite these investments and achievements, it was impossible for them to raise the price. In fact, customers seemed unwilling to accept the product unless the price was lowered even further, in addition to shrinking the external dimensions by half. It was quite normal for such outrageous demands to be placed on the electronics components business. The market environment was such that growth was fast, but competition was aggressive. However, Suwa Seikosha (now known as Seiko Epson) was able to distinguish itself from its competitors, thanks to its photolithography technology. Based on this technology, the company was able to launch new products on the market in rapid succession that were more compact and low-cost. 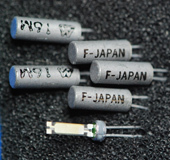 In the early 1980s, Suwa Seikosha grew to become a global corporation that led the tuning fork crystal unit industry. They became the world's leading tuning fork crystal unit manufacturer. There was no denying that they had risen to that status, even from an objective viewpoint. Ordinarily, this would have been a situation that would have enabled the company to sit back happily and rest on its laurels. However, those working in the Quartz Device Department at the plant located in Ina, Nagano Prefecture were not satisfied with this situation at all. The reason for this was they could not get their corporate customers to acknowledge them as ‘quartz device manufacturers.’ Although it was true that the business had started as a supplier of components for ‘SEIKO’ branded watches, the company had expanded in scale significantly since the mid-1970s, when they had begun to actively pursue external sales. By the early 1980s, they had truly surpassed the limits imposed by the title of ‘watch manufacturer components business.’ However, when sales staff visited their customers, many made comments to the effect that Suwa Seikosha was no more than a quartz device department of a watch manufacturer, as though it were therefore not possible to expect very much of Suwa Seikosha as a company. From around this time, a glint of ambition began to flicker in the Quartz Device Department as they dreamed of expanding the business even further in order to be more widely recognized as an independent business division, both in name and in reality. Why couldn't they obtain recognition as a quartz device manufacturer, despite the fact that they virtually dominated the entire global market for tuning fork crystal units? The answer was actually very simple. The fact was that the market for tuning fork crystal units was not the main playing field for quartz devices. The main focus was actually the market for AT-cut crystal units and crystal oscillators, which are used in telecommunications and other devices. Suwa Seikosha had not yet entered this market at that point in time. 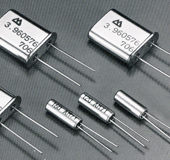 Furthermore, the scale of the market for AT-cut crystal units and crystal oscillators was rapidly growing in the early 1980s. Until then, applications for AT-cut crystal units had been limited to a few product categories, such as corporate telecommunications devices, but the ‘conversion to digital’ that was beginning at this time led to a surge in demand for consumer electronics devices. In addition, the market for brand new electronic devices known as ‘personal computers’ was also expanding at breakneck speed. Opportunity was ripe, and they could not let it pass them by. Employees at Suwa Seikosha collectively decided that they would enter the market for AT-cut crystal units and crystal oscillators, and that they would become the best in this market as well. So although they had made the decision to enter the market for AT-cut crystal units and crystal oscillators, they had not yet decided exactly what kind of device they would manufacture in order to achieve this. At that time, the ‘HC-49U’ was positioned as the market's de facto standard in the market for AT-cut crystal units and crystal oscillators. This product was a round-shaped quartz fragment with diameter of approximately 8mm, and external dimensions of 11mm width × 4.7mm depth × 13.5mm height. Every competitor company had already launched an equivalent product. If more corporations later continued to enter the market, manufacturing the same products, they would quickly become embroiled in a price war, which would surely cause them hardship. And even if they launched a brand new, original product on the market, there was no guarantee that their customers would take favorably to it. Either way, the path they chose was going to be a gamble. After much discussion, they decided that they would stake their luck on an original product packed with the added value that Suwa Seikosha prided itself on. You may wonder exactly what this added value was that Suwa Seikosha could provide. Actually, the answer to that question was easy: they would fully leverage their strengths in cylindrical tuning fork crystal units. At the time, Suwa Seikosha was manufacturing several million tuning fork crystal units per month. They therefore had enough confidence to think that they would definitely not lose to their competitors on the assembly line. Specifically, they realized that they could seamlessly manufacture their AT-cut units on the tuning fork crystal unit assembly line. The assembly line could be used with no changes if they made the basic configuration the same. In other words, they decided to commercialize a cylinder-shaped AT-cut unit. The HC-49U was enclosed in a flat, round metal can. This new product was a completely different shape to the HC-49U. They were now ready to confront their biggest rival head-on. Equipment to process the raw quartz and quartz wafers was purchased externally, and by using the assembly line for their tuning fork crystal units, they succeeded in commercializing their first cylindrical AT-cut unit in 1986. Known as the ‘CA-301,’ this was a small unit of just 3mm diameter and 8mm length (see Figure 1). Furthermore, at around this same time, Suwa Seikosha also managed to commercialize the ‘SG-51,’ a crystal oscillator (clock oscillator) that molded together an AT-cut unit and an oscillator IC using a plastic mold. It, too, was small, with dimensions of just 19.8mm × 6.36mm × 5.3mm. By making both these products more compact, Suwa Seikosha succeeded in staying one or two steps ahead of its competitors' products. In addition, the market for AT-cut units and clock oscillators was expanding. It was commonly believed that business would soon be booming. However, the scale of the business did not expand as optimistically as expected. ‘It wasn't that we were incapable of selling any. Despite being a manufacturer that had entered the market late in the game, we had been able to secure a reasonable share of the market, and we felt that we had battled bravely. However, we were not so successful that we could seize the leading position in the market. In fact, we were not yet in a situation where we could even see the top position of the AT-cut unit and clock oscillator market’ says Kenichi Teradaira. In 1986, the ‘CA-301’ was brought to market. It was small, with external dimensions of just 3mm diameter and length of 8mm. The larger product depicted in the photograph is the ‘HC-49U,’ which was mainstream in the industry at that time. It was clearly much larger, with external dimensions of 11mm width x 4.7mm depth x 13.5mm height. Following the CA-301 and the SG-51, they also brought to market the ‘SG-531,’ an even more compact clock oscillator with external dimensions of 13.7mm x 7.62mm x 5.3mm. The business scale was expanding gradually. Although the position of industry leader still seemed a very long way away, ‘we were able to build a bridgehead,’ says Jitsuo Iwamoto. Still, they knew they wouldn't be able to claim the industry's top position unless they made some changes. They needed to hammer out some kind of new plan. The next plan involved something that was never far from the thoughts of anyone working in the quartz device industry. The engineers and sales managers at Seiko Epson (the name of the new company born from the merger between Suwa Seikosha and Epson in 1985) were constantly being asked the same question by every client corporation they visited on their sales calls for AT-cut units and clock oscillators. That question was: "Why are quartz devices only compatible with insert mount technology?" By around 1987, ICs, resistors, inductors, and condensers had all been made compatible with surface mounting. However, quartz devices had not yet reached this stage in development. That time was the true peak for the manufacture of much more compact electronics devices such as video cameras, portable audio cassette players and laptop computers, and the demand for surface-mounted components was increasing. If only they could implement surface-mounted technology, they would be able to mount electronic components on both the front and rear surfaces of printed circuit boards (PCBs), which would enable them to dramatically reduce the surface volume of PCBs. They desperately wanted to be able to create a quartz device that could be surface-mounted, so that they could make electronic equipment even more compact. That was the reason why many electronics manufacturers voiced this request to quartz device manufacturers. However, none of the quartz device manufacturing companies at that time were capable of meeting such a request. That was because no engineers had been able to break through the two impenetrable technical issues of ‘impact’ and ‘heat.’ Normally, a chip mounter (surface-mounting device) and flow-reflow soldering equipment were needed to mount surface mounting-compatible products on PCBs. ‘Impact’ occurred when the chip mounter was used to place the quartz devices on the PCB. Conversely, ‘heat’ was applied during the flow/reflow soldering process. According to Mutsumi Negita, "It was likely that every quartz device manufacturer was blaming their inability to overcome these two issues on the specialist nature of quartz devices." Everyone in the industry was of the opinion that trying to secure impact-resistance and heat-resistance was a harebrained challenge. However, Seiko Epson decided to tackle the problem for themselves. If they could just chip away at the barriers imposed by ‘impact’ and ‘heat,’ they would surely be able to break through the stagnation that was present in the business of AT-cut units and clock oscillators. And then suddenly, they succeeded in clearing the first hurdle much faster than expected when they achieved impact resistance. Since the cylindrical tuning fork crystal units that Seiko Epson was developing had started out as components for watches, they had already managed to pass strict drop tests. This is what set Seiko Epson apart from its competitors, who had started out by trying to develop crystal units for telecommunications devices. The only other hurdle was to achieve heat-resistance. However, this was more difficult than one might think. Days and weeks passed by quickly, as though time was taunting them. Kazushige Ichinose, the man in charge of developing clock oscillators to make them compatible with surface mounting, gradually began to work himself into a state of panic. "Perhaps it was a foolhardy challenge, after all... if we don't produce some results soon, the development project may be terminated." At this point, Haruo Takada, who was Mr. Ichinose's boss, concocted an extremely radical plan. He appointed Hiroyuki Ogiso, a young engineer in his third year at the company, to be in charge of developing a technology to secure heat-resistance. "We weren't getting anywhere with our technical development, so we needed to change our thinking. I therefore entrusted the project to Hiroyuki, who excelled at logical thinking," said Mr. Takada. Hiroyuki was puzzled by his sudden promotion, and was unsure as to whether he could meet the expectations of his boss. However, he immediately came to the realization that he must have been chosen for a reason, and he decided to put his full weight behind the task, knowing that he had nothing to lose. Even so, he didn't know where to start. He had been informed by Mr. Takada that reflow soldering was performed at 270℃. All he had been instructed to do was to simply ‘develop a crystal unit that could withstand those temperatures.’ He had to work out details such as what a 270℃-resistant crystal unit would require, and what kind of characteristics or conditions it would have to satisfy. But first and foremost, he had to learn what surface mounting technology was…Even this concept was a mystery to him. Hiroyuki decided that the first thing he needed to do was to gain a firm understanding of surface mounting technology. Having made this decision, he quickly headed to a particular floor of the company, quickening his pace as he hurried through the halls. In addition to the Quartz Device Division, the Ina Plant at that time also had a division for manufacturing electronic circuit boards for printers. Surface mounting was an important technology for these circuit boards, and naturally, was implemented as part of the processes here. Hiroyuki headed straight for the division Chief's office. He negotiated directly with the division Chief and obtained permission to closely observe the manufacturing line. By actually watching the surface mounting process for himself, he was able to spot something quite surprising. Hiroyuki had been assigned the goal of developing a crystal unit that could withstand 270℃. But many other factors also needed to be considered. For example, heat could be applied either by a method known as ‘infrared reflow (IR),’ which gradually heats the whole electronic component, or ‘flow soldering,’ which dips the component in a bath of melted solder. In addition, the flow solder method was repeated so mounting could be performed on both the front and rear sides of PCBs. He was quite surprised at the severity of the environment the crystal units would have to withstand. The heating methods were also completely different, as was the number of heating applications required. Cylindrical crystal units at that time used soldering material for the internal connections and seals. Heating the crystal unit to a high temperature could result in the solder melting. His job was to develop crystal units for manufacturing clock oscillators, so he first needed to check how much heat was going to be applied during the assembling process for the clock oscillators. Hiroyuki then went to observe the manufacturing line for clock oscillators. His observations confirmed that quite high temperatures were being used during the plastic molding process. Hiroyuki compiled a list of his observations, which revealed in detail the temperature that was applied to crystal units, both internally and externally. This led him to create a set of target specifications. Unless these target specs could be achieved, it was not going to be possible to launch a heat-resistant crystal unit on the market. As a trial, he tested existing insert mount-type clock oscillators by heating them to the same temperature as the target specs. As expected, the oscillators did not survive the process. The solder inside the crystal units melted, completely covering some of the quartz fragments. Other quartz fragments simply fell off the terminal, or short-circuited electrically. Given that the company was capable of manufacturing compact, cheap cylindrical crystal units, it would have been wasteful not to include them in the process platform. Hiroyuki decided that they needed to change the connecting and sealing material to one that could be guaranteed not to melt when heated. He began to collect a variety of connecting and sealing materials from all over Japan, and tested and investigated every one of them for resistance to heat and melting, expandability, and cost. Although he was unable to find an optimal soldering material, he discovered a solution that was potentially going to work, simply by modifying some of the processes and using high-temperature solder with a special composition. Although he had now decided on the connecting and sealing material, the task was not over yet. He also needed to optimize the coating method to improve the solderability of the electrode terminals and productivity. Conventionally, coating materials are not composed of only metals, but also comprise a variety of a mixture of additives (organic materials). These organic materials evaporated when heat was applied, thereby adhering to the surface of the quartz fragment and fluctuating the normal frequency. However, the quartz device would be considered to have failed if the normal frequency fluctuated greatly. Hiroyuki visited many coating manufacturers in order to find a coating material with organic material that would not evaporate when heat was applied. Although these manufacturers tested many coating materials for him, Hiroyuki was still unable to find the perfect one. Even when the best coating materials were used, the organic materials would still evaporate and the normal frequency of the clock oscillator stayed at approximately 50ppm. He felt sure that his client corporations would reject the ‘SG-615’ as a clock oscillator. He still needed to reduce the fluctuation band to zero. Hiroyuki was the kind of guy who came up with amazing ideas when working under pressure. He figured out that if the organic materials were going to evaporate, then they should be made to evaporate first so that they could be removed in advance. It was a completely unique way to resolve the problem. So they added a process to evaporate the organic material by heating it at a little over 270℃, after which the gas was removed. Finally, they had resolved the advanced technology barriers of both impact-resistance and now heat-resistance. 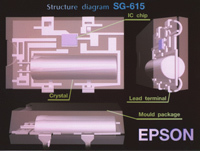 Figure 3: The internal construction of the SG-615. The cylindrical AT-cut unit and IC chip for the oscillator were mounted on a lead frame and then the whole unit was plastic-molded together. The center of this photo depicts the elusive compact clock oscillator, which was a prototype only and was never brought to market. The photo on the left shows the commercialized SG-615. Comparing the two, it is clear that the special clock oscillator prototype was much smaller. The oscillator on the right of the photo is the ‘SG-636,’ which was released after the SG-615. At last, these were the surface-mounted clock oscillators that almost all electronics components manufacturers had been impatiently waiting for. Naturally, everyone at Seiko Epson expected that they would be bombarded with new orders for their groundbreaking clock oscillators (see Figure 5). However, the reaction from the market was underwhelming. Some sales representatives even made fun of it, criticizing the black plastic mold, and saying that a metallic silver color would have made the clock oscillator look more expensive and prestigious. Why wasn't this new product selling like hotcakes? They could see no reason why it wasn't selling. For several months following its release, the Quartz Device Department staff waited worriedly. And then, a certain sales rep revealed that he had heard that a buyer from a major U.S. computer manufacturer was planning to come to Japan. The sales rep pulled some strings and made contact with the buyer, and succeeded in arranging for him to come to Ina for a meeting. Mr. Ichinose, who was in charge of development for surface-mounted clock oscillators at that time, was encouraged by this opportunity of a lifetime. If they could convince this globally well-known computer manufacturer to adopt their clock oscillators, they would be able to anticipate huge orders for their products. Mr. Ichinose prepared plenty of documentation and rehearsed his presentation several times. He was fully prepared. On the day, Mr. Ichinose delivered a spirited presentation. He explained everything there was to know about the ‘SG-615.’ However, the reaction of the computer-manufacturing giant's buyer was less than enthusiastic. It appeared that he didn't have many questions, and Mr. Ichinose begun to worry, asking himself whether he might have made a mistake, or whether the SG-615 might have any faults. 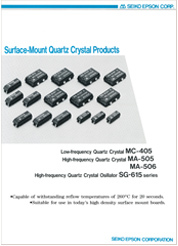 In addition to the ‘SG-615’ surface-mounted clock oscillator, this catalog features the ‘MA-505/MA506’ surface-mounted AT-cut units and the ‘MC-405’ surface-mounted tuning fork crystal unit. During intermission, Mr. Ichinose went to the bathroom. Even there, he found himself questioning what the problem could have been. Just then, a tall American man spoke to him. It was the buyer! He pulled a copy of the magazine from his pocket, and said to him: "You wrote this article, didn't you?" It was an article that Mr. Ichinose had written and submitted to a newspaper company-owned technical magazine for foreign readership, without his boss' permission, after colluding with the aforementioned sales staff (see Figure 6). “That was a fantastic article,” said the man, enthusiastically flipping through the pages. Although Mr. Ichinose thought it a little odd that this conversation was taking place in the bathroom, their exchange began to get more and more animated. And it was this conversation that led to an important development in the negotiations. Mr. Ichinose returned to the meeting room and summarized the details of his presentation. After that, their business negotiations proceeded smoothly. 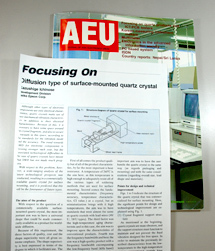 An article was submitted to the Journal of Asia Electronics Union 1988/No.2, a magazine aimed at Asian countries and published by Dempa Shimbunsha. According to Mr. Ichinose, the buyer from the computer manufacturing giant had previously read this article. That was the reason why he had come all the way to Ina for the meeting, despite the somewhat sudden invitation. Their good fortune continued. It was revealed that the largest manufacturer of clock oscillators, a U.S. company, had announced they were withdrawing from the market. In fact, that U.S. company had also succeeded in developing a surface-mounted clock oscillator, and had only just begun to market it. However, they had decided to withdraw from the market prior to starting up volume production of the oscillators. Accordingly, the majority of the remaining electronics device manufacturers that had been considering purchasing the surface-mounted clock oscillators of that U.S. corporation also came along to Seiko Epson. Production volume increased dramatically, In this way, the SG-615 became an historical high-performance machine that supported Seiko Epson's Quartz Device Division. Joined Matsushima Industry Co., Ltd., a subsidiary of Suwa Seikousha Co., Ltd. (now known as Seiko Epson Ina Plant) in 1974. Mr. Negita became engaged in the development of crystal devices immediately thereafter, and has continued in this vein for the 37 years ever since. Mr. Negita is currently (as at September, 2011) an instructor for the next generation group of engineers in his role as the Deputy Chief of the TBDU Manufacturing Technology Department. Joined Matsushima Industry Co., Ltd. in 1971. Initially, Mr. Teradaira was in charge of manufacturing technology for circuit boards for quartz watches. After this, he was placed in charge of manufacturing technology for crystal units. He was in charge of package design in the development of the ‘SG-615’ surface-mounted clock oscillator. Joined Matsushima Industry Co., Ltd. in 1971. Initially, he was engaged in processing rubies used for quartz watch jeweled bearings. After this, he was involved in mounting circuit boards for quartz watches. He acted as Project Leader for transferring the company's manufacturing technology to its Malaysian plant in the development of the ‘SG-615’ surface-mounted clock oscillator. He also moved to Malaysia, where he worked on expanding the manufacturing scale. Joined Matsushima Industry Co., Ltd. in 1971. Initially, he was involved in the development and manufacture of resistors and condensers, which are indispensable for quartz watches, as well as post processes for ICs. In the development of the ‘SG-615’ surface mounted clock oscillators, he worked under Mr. Haruo Takada as his manager, commanding development and design. After development, he used his own initiative to improve customer support for clock oscillators. Having retired from Seiko Epson in 2007, he now lives in the Inadani region of Nagano Prefecture. Studied at the ‘Nakazawa Research Institute’ at Shinshu University, which is well known in the quartz device industry. Joined Matsushima Industry Co., Ltd. in 1985. Mr. Ogiso was the engineer who proposed the technology that resolved the biggest hurdle in the development of the SG-615 surface-mounted clock oscillator: the issue of heat-resistance. He is currently engaged in planning new products and new businesses. Joined Matsushima Industry Co., Ltd. in 1971. Was engaged in manufacturing technology for circuit boards and quartz oscillators for quartz watches. He was in charge of product design for the ‘SG-615’ surface-mounted clock oscillator. Specifically, he was in charge of the ‘J bend’ design for terminal forms.